We study the wave-particle interactions between lower band chorus whistlers and an anisotropic tenuous population of relativistic electrons. We present the first direct comparison of first-principle Particle-in-Cell (PIC) simulations with a quasi-linear diffusion code. In the PIC approach, the waves are self-consistently generated by the temperature anisotropy instability that quickly saturates and relaxes the system towards marginal stability. We show that the quasi-linear diffusion and PIC results have significant quantitative mismatch in regions of energy/pitch angle where the resonance condition is not satisfied. Moreover, for pitch angles close to the loss cone the diffusion code overestimates the scattering, particularly at low energies. This suggests that higher order nonlinear theories should be taken in consideration in order to capture non-resonant interactions, resonance broadening, and to account for scattering at angles close to 90 degrees. Camporeale, E. (2015). 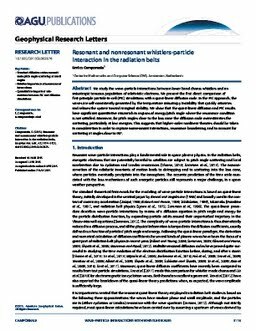 Resonant and non-resonant whistlers-particle interaction in the radiation belts. Geophysical Research Letters, 42, 3114–3121.